There is an undeniable under-representation of women in the tech industry. Recent studies show women own only 5% of start-ups in the US, while In the UK, only 5% of women are in a technology leadership role — So, why is this? According to an in-depth study conducted by Catherine Ashcraft, Director of Research and Senior Research Scientist for the National Center for Women & Information Technology (NCWIT), there are three primary issues which have resulted in the lack of women in technology-specific roles and leadership: societal influences and biases, school education, and workplace systems. 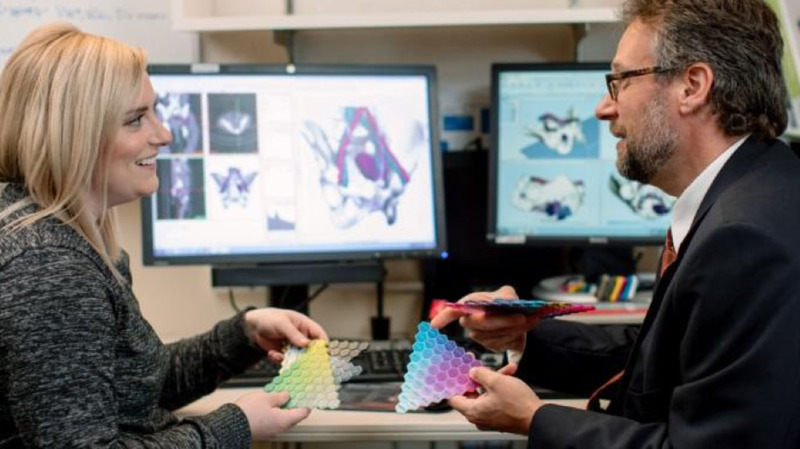 In this Strength-in-Numbers series article, we speak with Amy Alexander, Senior Biomedical Engineer at Mayo Clinic, where she converts 2-D radiological images into 3D-printed models and surgical guides. We're happy to share Amy is our 7th Annual Aspirations in Computing Award ceremony keynote speaker on April 17th. In this Q&A, She discusses what she believes can be done to improve participation by women in the technology industry. AA: I am a Senior Biomedical Engineer at Mayo Clinic in the Department of Radiology. 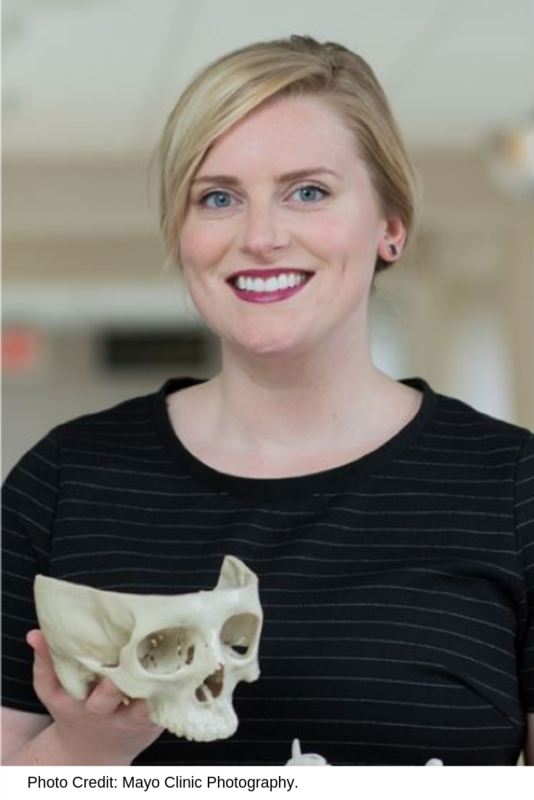 My work involves using radiological data for surgical planning, which can mean patient-specific anatomic modeling, patient-specific cutting guide design and tooling, modeling for education (patients, medical school students, residents, fellows), or modeling for research to learn more about how this work impacts patient care. The main technologies I work with are radiology PACS (picture archiving and communication systems), medical imaging applications, CAD/CAM (computer aided design/manufacturing) applications, and 3D printers. 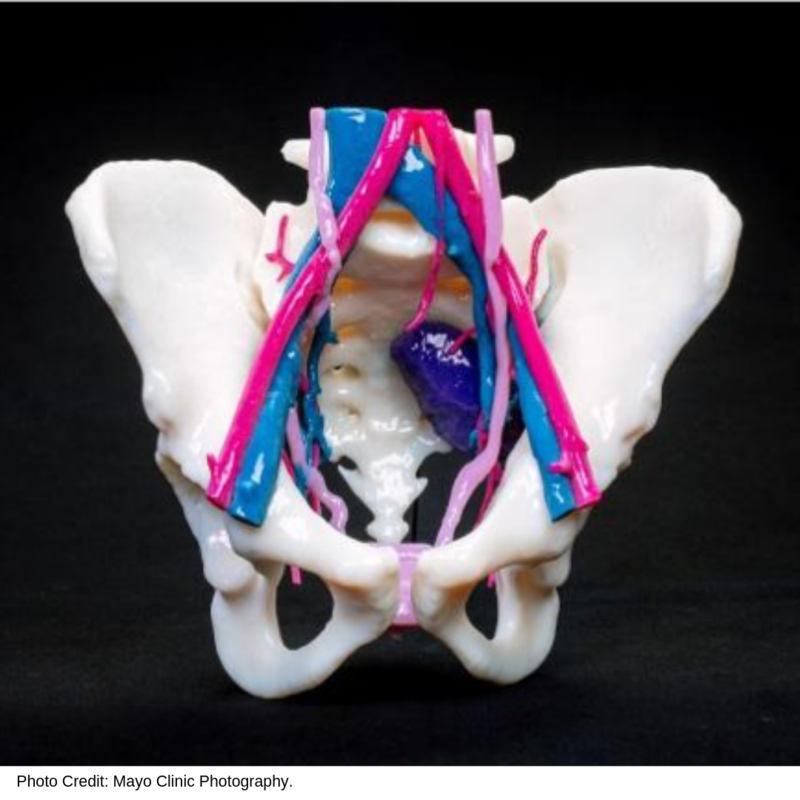 3D printed anatomic models are used for visual aid, procedure simulation, or task training. The surfaces of those models can also be used to design patient-specific bone fitting devices that are 3D printed and used in surgery. MNAiC: As a whole, women in tech in the U.S. leave the industry at a 45% higher rate than men, further reducing the potential for women to assume leadership roles within tech. What do you think are some of the unique challenges women face in this male-dominated industry? AA: The challenges I’ve faced in my education and career are not related to the technical work itself, but have more to do with the social side of the workplace. In general, it is difficult to build confidence in your abilities when you are different from everyone else in your class or on your team. There were many times in engineering school when I was the sole woman in the class, and it caused young men in the class to talk about me in insulting ways. This became rarer in the professional workforce, but I still run into strong male personalities who belittle me. This is usually before they get to know me and realize that my background, skillset, and drive are going to help them optimize the output of their projects. MNAiC: Have you ever had to overcome (or help other women overcome) these challenges? If so, what did you do? AA: My answer to this question is an overwhelming ‘yes’. Out of respect, I won’t share any specific stories, but it is more likely that a woman has been subjected to and dealt with gender-related bias than not. These situations usually require a one-on-one discussion with the goal of reframing the problem into a solution; e.g. : what can we do to change the opinion of this person and prevent this damaging behavior going forward? You cannot control the actions of others, but you can control how you react to them, and how you build pride in yourself and your work. MNAiC: What were the greatest influences on your technology career choice, and direction? If something specifically happened that triggered your career decision, what was it? AA: I was in 9th grade Biology class, and we had a guest speaker who was a biomedical engineer at Mayo Clinic in Rochester, Minnesota, my hometown. It was the first time I had heard of ‘biomedical engineering’, and she told us about how she created tools that helped surgeons improve their work in the operating room. My internal lightbulb flickered and I knew that this was a path I needed to explore. Mayo Clinic has had engineers at the helm of medical device development for over 100 years, and in that time they have worked with medical providers to improve the lives of countless patients. I had always enjoyed math and science, and the idea of incorporating patient care appealed to me from a human perspective. I hoped that I could build a career that was both intellectually and intrinsically fulfilling. MNAiC: What do you think are 3 things Minnesota businesses can do to help remove these barriers in order to promote and retain more women leaders in technology? AA: Put more qualified women in leadership roles. Schedule more classroom visits with professional women at the middle school level. Encourage young women to try career shadowing and mentorships at the high school level. MNAiC: What barriers do you think are most challenging to address and why? AA: The greatest barrier to young women choosing technological careers is the lack of exposure to options. Classroom visits and job shadowing are so important at the middle and high school level. If you don’t know a career exists, how can you work toward it? MNAiC: What can young aspiring women technologists do today to prepare themselves for a future career in leadership? AA: It’s important to build your circle of trusted colleagues and partners who motivate you to be the best version of yourself. Leadership is about more than management. Leading a team requires empathy and the ability to utilize everyone’s individual strengths while championing the mission of the group as a whole. Listening is far more important than talking. Acknowledge the strong work of others and promote an inclusive culture. MNAiC: Why do you think it’s important to move toward more gender consciousness in tech leadership? AA: Women are likely to have both aligned and complementary abilities to their male counterparts in technology. It’s only logical to bring as many perspectives as possible to the leadership table. MNAiC: What advice would you give to women who aspire to advance their career in tech? AA: Reshma Saujani, founder of Girls Who Code, gave a recent interview entitled “Fixing Tech’s Gender Gap” with the Harvard Business Review in the publication’s IdeaCast series. When asked about her strategy for overcoming the societal expectation of perfection, she replied, “I practice imperfection.” I love that idea. Failing often is the quickest way to learn and grow. It’s part of the process. Do things you think you can’t do, and learn to love the feeling of surprising yourself. Find something you like to do, learn to do it well, and never stop advancing your skills and education. At the same time, know that perfection is not the goal. Doing good things for your community and for humankind is the goal. We would like to give special thanks to Amy for taking the time out of her demanding schedule to share her thoughts with us as well as deliver the Keynote message at the 2019 Minnesota Aspirations in Computing Awards Ceremony on April 17th. She’ll be addressing 37 top level female high school students from Minnesota who have been selected as national and/or state honorees. Also in attendance will be parents, educators, and Aspirations program sponsors and guests from 30 businesses and organizations who are collaborating to significantly increase the quality and quantity of young women pursuing a technology education and career path. MNAiC collaborates with businesses, organizations and schools to inspire, support, and empower young women in high school to become our next, best Minnesota-grown technology talent. To learn how your organization can support the computing interests of young women in Minnesota and lead the movement to disrupt gender equality in tech, contact Russell Fraenkel, Director of IT Career Pathways and Partnerships, Minnesota State – IT Center of Excellence, at russell.fraenkel@metrostate.edu, call (612) 659-7224.